It's the middle of summer in Australia and in my little corner of the world, it's on the rather hot side. But that doesn't stop me from dreaming about the romantic notion of experiencing a white Christmas one day. 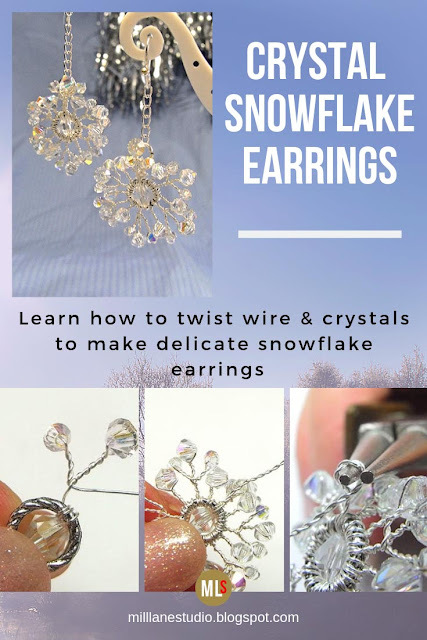 With that thought in mind, I was inspired to create snowflake earrings that catch the light and glisten like snowflakes as you move. These earrings are lovely and lacey and even look a little bit like filigree when you're wearing them but they are a bit on the challenging side because of the detail. Making them is fiddly but if you've got a few hours up your sleeve and you have patience, then this is a challenge worth accepting. Tools: chain nose pliers, round nose pliers, nylon jaw pliers, flush cutters, ruler. 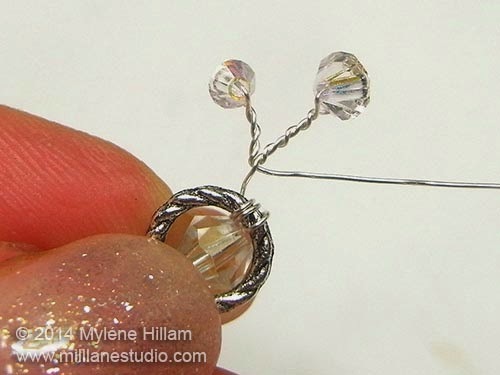 Tip: Take care not to overtwist the wires in this project - 28g wire is easily broken if it's overworked. If it should happen to break, end the wire off by wrapping it around the ring a couple of times to secure it and then start with a new wire and anchor it the same way. Cut 1m (39") wire. 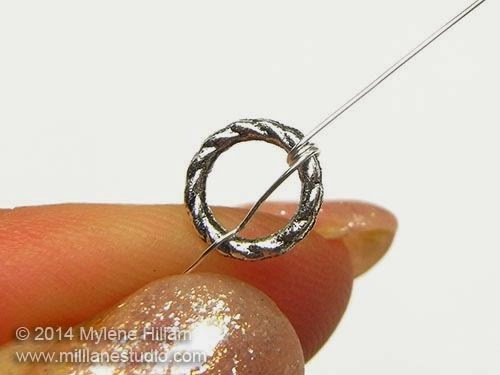 Leave a 75mm (3") tail and wrap the wire around the ring twice to secure it. It should start and finish on top. 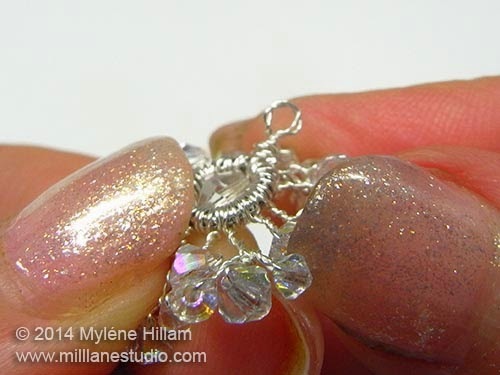 String the 5mm crystal and wrap it twice around the opposite side of the ring. 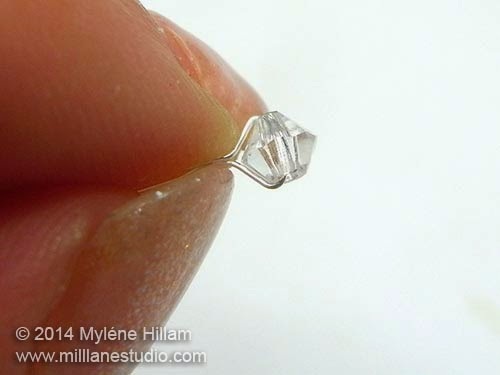 Bend the wire 1cm (3/8") from the ring and string a 4mm bicone. 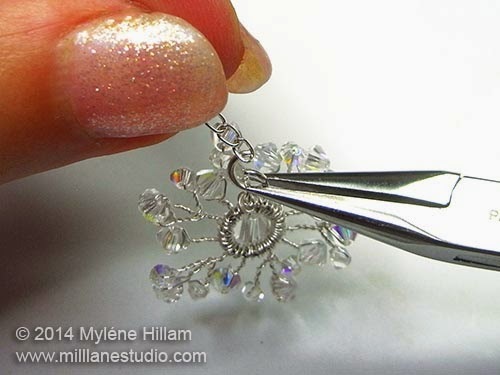 For a symmetrical snowflake, measure the length of this long stem on each of the six stems you create. 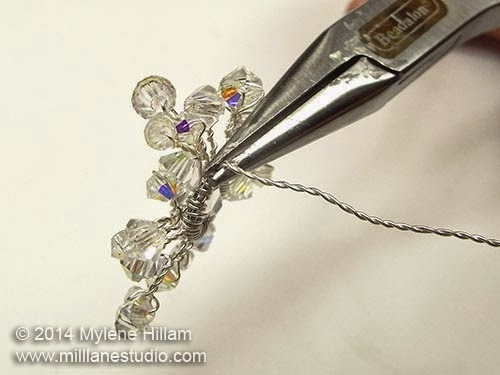 Push the bead up to the bend in the wire and bend it where it exits from the bead. 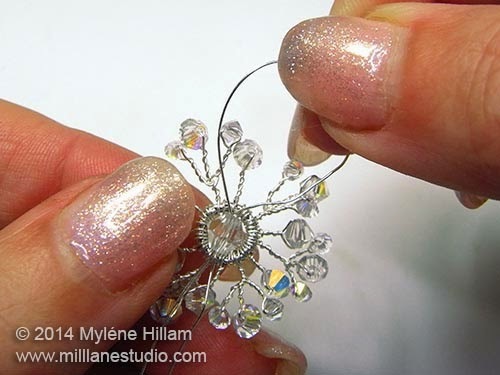 Bend the wires so that they follow the contour of the bead and then pinch them together. Whilst still pinching with one hand, twist with the other to start the twist. After one or two twists, it will look something like this. 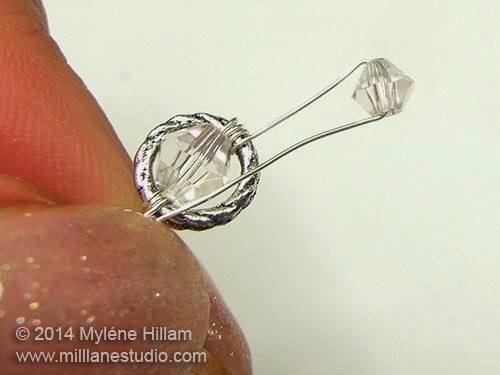 Hold the two wires together on this "stem" where you want the twist to stop - I made it about 4mm (1/6") from the ring - and continue twisting it. This will tighten the twist. 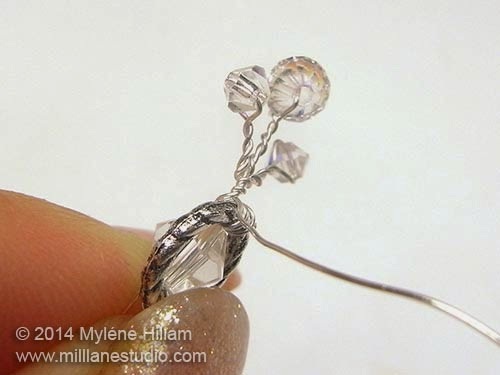 String a 2.5mm crystal and position it at the same height as the 4mm crystal. 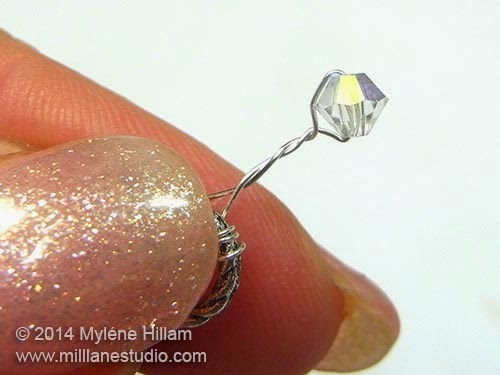 Bend the wire on both sides of it and then pinch them together as before. 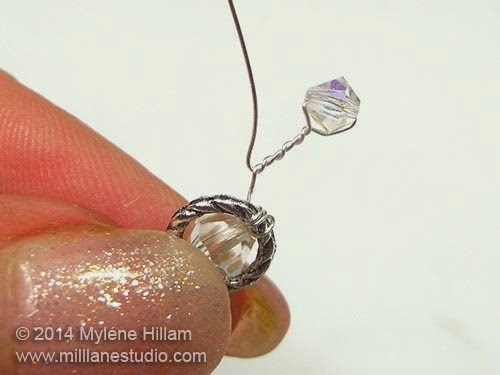 Hold the two wires together at the point where the twisted wire of the first bead ends. 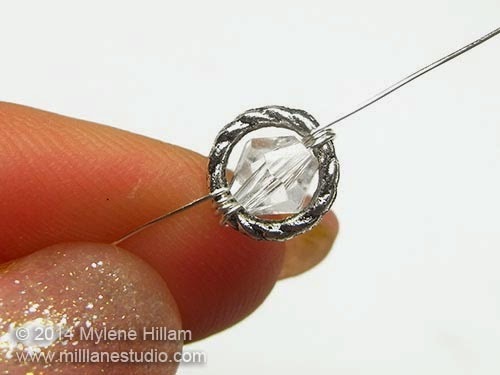 String another 2.5mm bead as before and twist it into position. 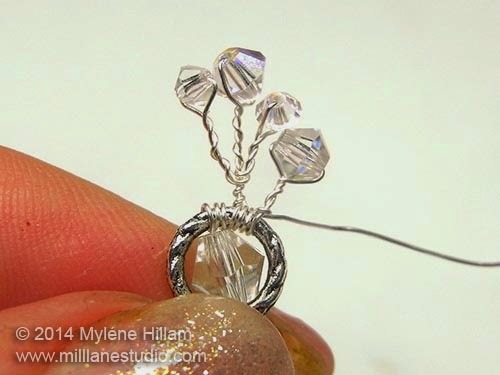 Wrap the wire twice around the ring to anchor the first stem in place. 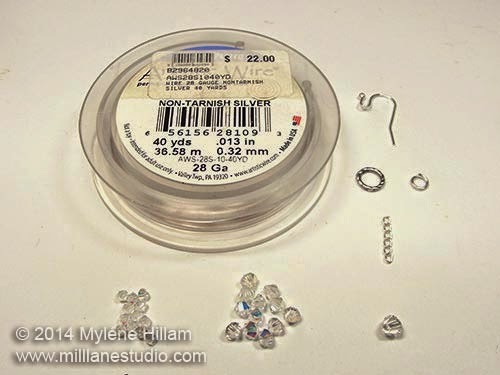 Add a 4mm bicone to the wire. Position it so that the hole sits at the point where the twist of the 2.5mm begins. Pinch and twist as before. 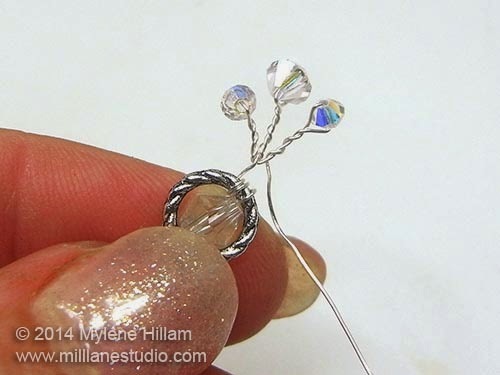 Wrap the wire around the ring twice and continue adding beads in this pattern until you have added 6 long stems and 6 short stems. 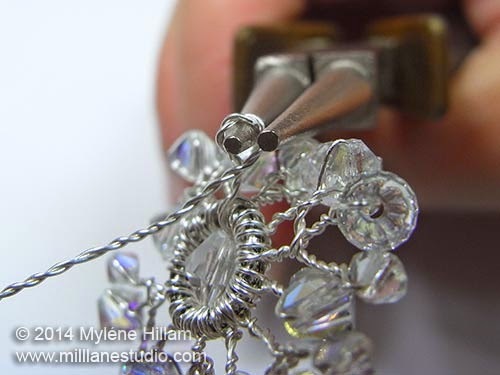 Tip: If you are finding it fiddly to pinch the wires, use chain nose pliers to grip them and then twist! 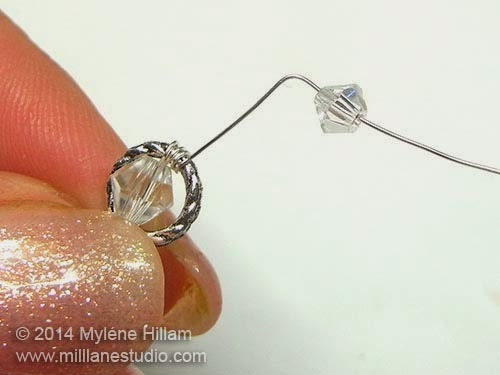 Make sure you have anchored the wire and then return the wire back to the start point but making sure it is on the opposite face of the ring. Twist the two wires together . 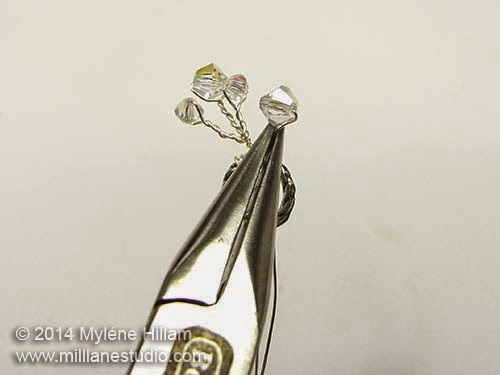 Use chain nose pliers to create a neck. 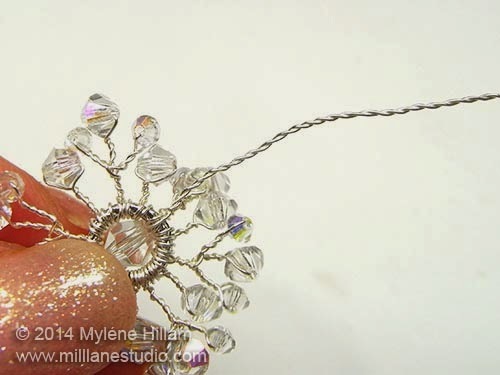 and wrap the wire around the neck two or three times to secure. Trim away close to the neck - just take care not to cut the wrong wire! 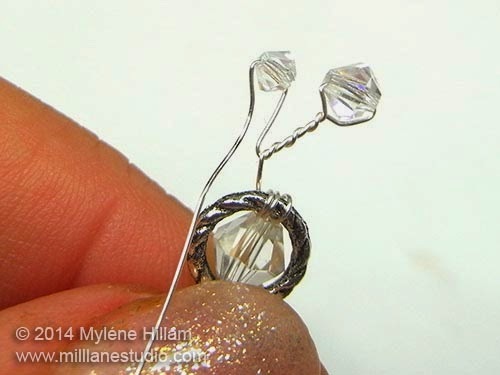 Separate the chain into two 6-link lengths and set one aside for the other earring. Open the jump ring and hook on the wrapped loop and the chain. 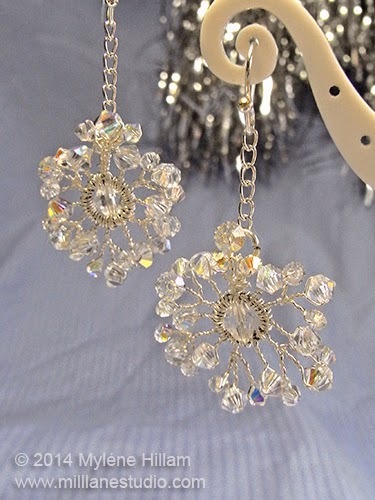 These delicate earrings glisten and catch the light as you move - a very pretty, sparkly pair of Christmas earrings. 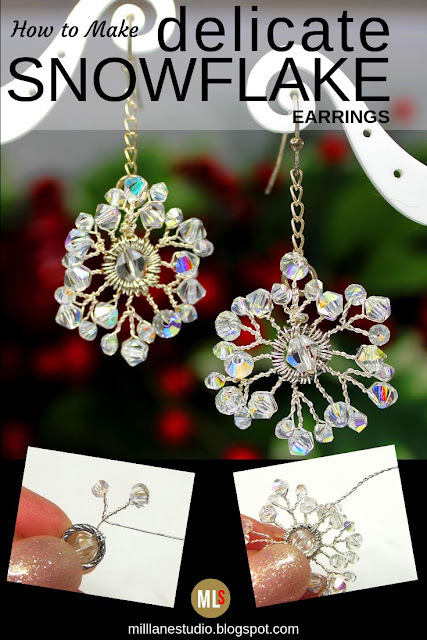 You'll find more inspiring earrings in my Twelve Days of Christmas Earrings ebooks series. 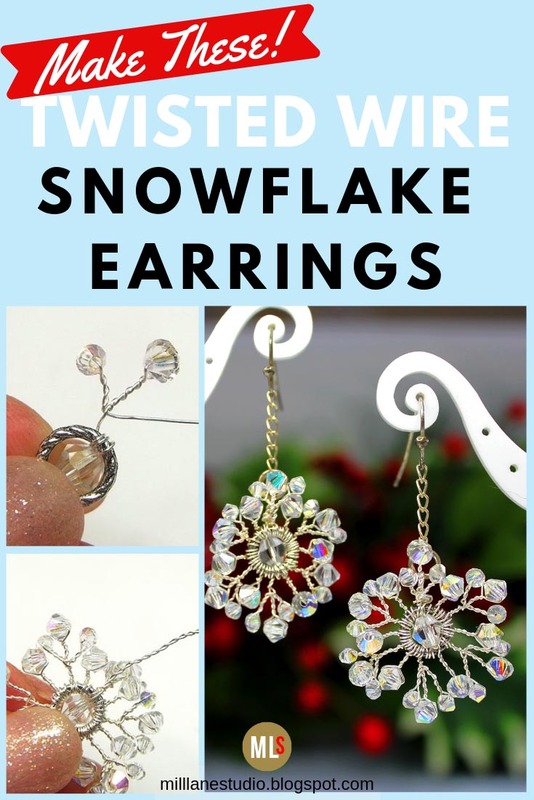 There are both easy and challenging designs to make using a variety of different jewellery making techniques. 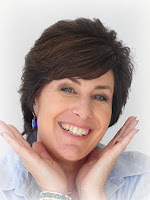 Each book is a printable pdf that you can download immediately after purchase. Click the cover of each book and you'll be able to see the projects in that book.